During the town’s annual Block Party a student was severely slashed by a non-student. Sophomore, Roberto Soto was coming to the aid of a young woman who was punched by a man when he felt the edge of a blade slice across his face Saturday. Moments later, Soto was aboard an ambulance en route to a hospital emergency room. Soto was on his front porch at 383 ½ Lightstreet Road when the violent attack happened. At around 7:30 p.m. Soto saw a female being punched by a male. “You just hit a girl, you need to get off my property,” Soto yelled to three men. Soto described the man who attacked the woman as 5’8” African American male. Within seconds a different male came up to Soto and slashed him on the left side of his face from his left ear down to the corner of his mouth. “I could tell he has done this sort of act before,” said Soto. Soto said he held his face after he was slashed but didn’t realize how bad the cut was until his fraternity brother took him inside. He rode in an ambulance to a hospital in Danville, Pa. where the police filed a report. Soto believes that the three males were gang members. It took 30 stitches to close the wound. “You don’t expect those types of people to be around here; us students should be able to think that we are safe here,” he said. 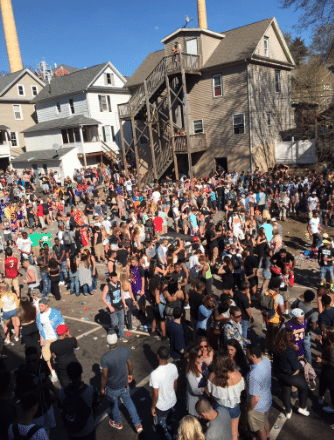 There were several altercations at Block Party on Saturday. A lot of these altercations can be found on twitter using a hashtag #BloomsBlockParty, #Blockparty2016. Soto is an Exercise Science Major and a member of Tau Kappa Epsilon Fraternity. Police are still investigating the incident. Any witnesses can contact Bloomsburg Police.